We’re sure you’ve seen it, a car pulled off to the side of the road, steam pouring out from under the hood. Maybe it has even happened to you. This unpleasant phenomenon is caused by an overheating engine. It is a common occurrence in Phoenix, Arizona, especially in the summer months. Heat is, by far, your engines worst enemy. Making yourself aware of the reasons for a vehicle overheating -and understanding the necessary preventive maintenance routines- can help you avoid major engine damage. There are some common problems that cause an engine to overheat, including a bad thermostat, blocked radiator, failed water pump, and a leaky cooling system. Some conditions are simple, straightforward repairs, and others require hours of work and expensive parts. Your vehicle’s engine functions properly within a certain temperature range. Depending on your vehicle’s make and model, that range is usually between 195 to 220 degrees Fahrenheit. 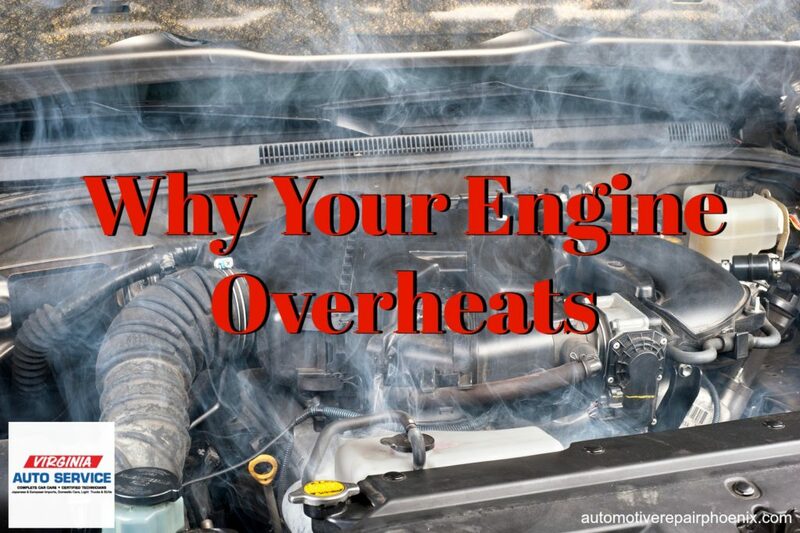 Overheating occurs when the temperature of the engine climbs to a point where mechanical damage can occur- usually a sustained temperature of over 240 degrees Fahrenheit. An overheated engine can cause serious damage to pistons, cylinders, bearings and valves, as well as other vital engine components. For this reason, you should never ignore the warning signs of overheating. You should shut down your vehicle at the first indication that your engine is operating above the preferred temperatures. Most of the causes of overheating come from a lack of circulation- which can be caused in different ways. A leak in the cooling system. The leak itself isn’t usually what causes the engine to overheat, it’s the air that enters the cooling system. When there’s a leak, the level of coolant drops below recommended levels and air is sucked into the system and circulated. Air is, of course, lighter than coolant, and rises to the top of the cooling system. When this happens, it is what we call an airlock. An airlock is a large air bubble that cannot be pushed through the cooling system. Because of this, the cooling system stops circulating effectively and the coolant that is left becomes overly hot. Water pump failure. A failed water pump is probably one of the most regular causes of overheating. The water pump is responsible for maintaining coolant circulation and is the most active component of the cooling system. After a period of time, the impeller in the water pump can break or wear out and no longer turn. Shortly after this happens, the engine overheats. Too little engine oil. It is not as widely known that the engine oil plays a large part in engine cooling. The oil lubricates the internal parts of the engine to prevent friction- a main cause of heat in the engine. Watch the temperature gauge on your dashboard, if it goes into the red, or the “hot engine” light comes on, pull over and shut off your vehicle to prevent damage. Remember that if your car overheats even one time something is wrong with your vehicle and it needs to be fixed. If your engine has overheated, Virginia Auto Service is here for you. We are your go-to in Phoenix, AZ for reliable, high-quality auto repair services. Call (602) 266-0200 or schedule an appointment online.